The Washington Cruisers Flag was flown from seven ships outfitted by George Washington personally to aid in his attempt to drive the British from New England. These ships were sailing before the Continental Navy was formed by Congress in late 1775, making them the de facto first Navy of the United States. The idea to use this flag apparently came from Colonel Joseph Reed, an aide to General Washington. The Continental Army was surrounding Boston in the late spring of 1775. The British Army was trapped inside the city. George Washington arrived to take command on July 3rd. He believed he needed to be able to attack the British from the sea as well as on land, so he began to commission some ships and fitted them out of his own pocket. The Congress in Philadelphia was nervous about forming a navy at this point because they did not want to offend the British, but Washington thought it was a necessity so he did it himself. Their mission was to prevent British ships from delivering much needed supplies to the army in Boston. On September 2nd, General Washington hired the first ship, the schooner Hannah, owned by the parents of Colonel John Glover. Washington hired Glover who served admirably throughout the war. He was the organizer of the Marblehead Regiment that ferried General Washington across the Delaware to his victories at Princeton and Trenton. The Hannah was soon run aground, but Washington commissioned six more schooners, Franklin, Hancock, Lynch, Washington, Lee and Harrison, all of which wreaked havoc on British shipping for the next year. He also had some floating batteries built on the Charles River that could be floated down to attack Boston. The batteries had walls built up with holes in the sides for muskets and holes in the bottom for oars. Large guns were situated on top. They looked like what you might imagine Noah's Ark to look like. The batteries fired on Boston on October 26 causing some damage and consternation. We have accounts that the small squadron which sailed some time ago is bombarding Fulmouth and Portsmouth. Our vessels must be careful how they fall in with them. Please to fix upon some particular colour for a flag, and a signal by which our vessels may know one another. What do you think of a flag with a white ground, a tree in the middle, the motto "Appeal to Heaven?" This is the flag of our floating batteries. 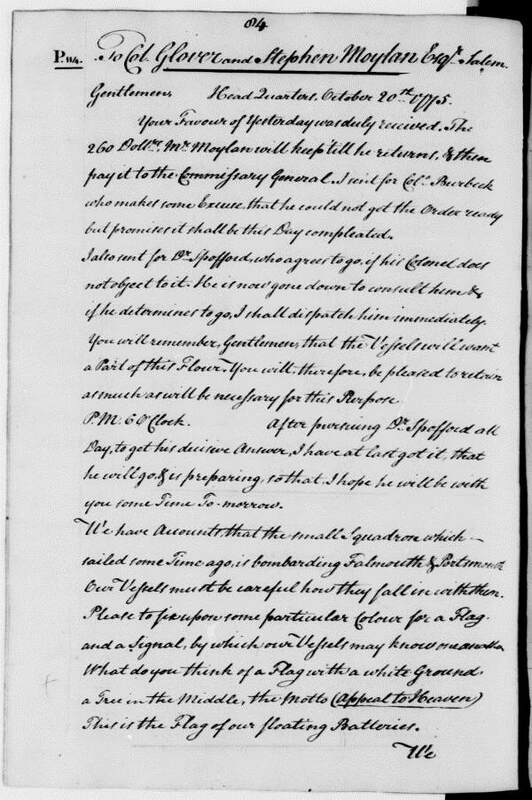 You can read the complete letter from Joseph Reed to Colonel Glover of October 20, 1775 and view the first page of the original letter here. After this time it is believed the Washington Cruisers Flag was flown from the ships. In October of 1775, Congress finally began to commission its own navy. Many of these ships may have flown the Washington Cruisers Flag as well. In April 1776, the Massachusetts Provincial Congress adopted a similar flag called the Massachusetts Naval Ensign for its own navy. In its resolutions for the operation of its naval service, the following resolution appeared on July 26, "Resolved, that the uniform of the officers be green and white, and that the colors be a white flag, with a green pine tree, and the inscription, 'An Appeal to Heaven.'" The Massachusetts Navy sailed 25 ships during the war to defend Massachusetts from the British. The Massachusetts Navy never disbanded, but was eventually absorbed into the United States Navy. The pine tree was a common symbol used to represent freedom in New England from the 1600s until 1776 when the Americans began to adopt other flags such as the Grand Union Flag and 13 Star Flag as their national flags. The citizens of Boston had been gathering around the "Liberty Tree," which was an old elm tree on the corners of Essex and Orange streets, since the days of the Stamp Act protests in 1765. In mid-1775, Boston loyalists cut the tree down. Flags bearing a Liberty Tree began popping up all over the place after this. This may have been the instigation for the patriots to put the tree symbol on their new naval flag. Even though the Liberty Tree was an elm, the pine tree was the long standing symbol of liberty on flags in New England so it may have been a natural fit. Because of the tree on the Washington Cruisers Flag, it is sometimes called the Liberty Tree Flag. You can also see the pine tree symbol on the Continental Flag and the Bunker Hill Flag. Read the lyrics of a song called Liberty Tree by Thomas Paine here. "...to the persecution and tyranny of his cruel ministry, we will not tamely submit; appealing to Heaven for the justice of our cause, "we determine to die, or be free." You can read the complete letter from Dr. Joseph Warren to the Inhabitants of Great Britain of April 26, 1775 here. 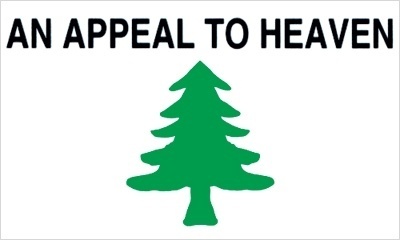 The traditional Washington Cruisers Flag has a pine tree in the middle with several downward pointing leafy branches over the words "An Appeal to Heaven." There is, however, some scholarly debate about what the flag looked like exactly. What shape was the tree? Were the words above or below the tree? What type of font were the words printed in? 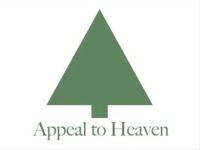 If you look online, you can find numerous versions with the tree depicted in many different ways, the phrase above or beneath the tree and the words saying "An Appeal to Heaven" or "Appeal to Heaven." The confusion arises because none of the original Washington Cruisers Flags have survived. We only have several impartial descriptions. 19th and 20th century flag historians came up with ideas of what the flags may have looked like and these ideas have been perpetuated by modern flag manufacturers. o get an idea of what the original Washington Cruisers Flags really looked like, we need to examine 3 pieces of evidence. First is the aforementioned Joseph Reed letter. In this letter, Reed states that the flag had "a white ground, a tree in the middle, the motto "Appeal to Heaven." So this tells us about the background color, that there was a tree in the middle and that the motto was "Appeal to Heaven," not "An Appeal to Heaven." It does not tell us about the shape of the tree or the position or font of the words. The next piece of evidence is a letter from British Admiral Hugh Palliser written to John Montagu, the Earl of Sandwich on January 6, 1776. On December 4, 1775, one of Washington's schooners, the USS Washington, was captured by the British and taken back to Boston. Admiral Palliser wrote of the capture to the Earl of Sandwich and in the letter he made this mention of the Washington Cruisers Flag, "Captain Medows has brought the American vesell's Colours, it is a white field with a green Pine Tree in the middle, the motto, Appeal to Heaven." This letter confirms the motto without the word "An," and also tells us the tree was a green pine tree. The flag was taken back to Britain and paraded in the streets. Newspapers accounts also tell us of its description. So now we know the Washington Cruisers Flag had the motto Appeal to Heaven and had a green pine tree in the center. We don't know yet know, however, what the tree was shaped like or what font the words were in or which letters were capitalized or not. 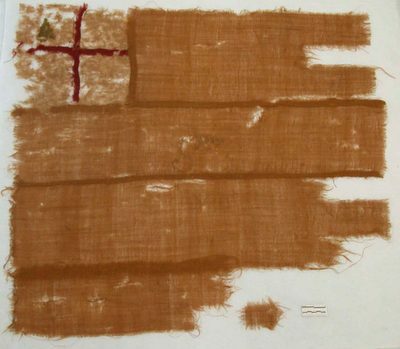 The 3rd piece of evidence to help us determine what the original Washington Cruisers Flags looked like, is an old flag that was discovered at a Long Island auction in 1993! The flag was found in an old trunk purchased by a Gary Laube in Southold, New York. This flag has been studied by historians and believed to be the single oldest flag from the British colonies. It dates from the late 1600s and is called the Southold Flag. The Southold Flag is made of tan wool with a white wool canton, the upper left corner portion. In the canton is a red St. George's Cross. The St. George's Cross on a white flag was the symbol of England prior to 1707, when Scotland joined England to form Great Britain. After that, the British Red Ensign, also known as the Queen Anne's Flag was the official flag of Great Britain. In the upper left corner of the canton is... a pine tree! It seems the colonists had taken their own British flag and put a pine tree in the corner, a symbol of liberty in their minds, to make the flag their own. The flag also contains the words "5 Regt." in the center of the flag. This helps us know the flag was a military flag and not a naval flag. Rabbit Goody, a textile expert from Cherry Valley, New York has examined the flag and stated in a 2002 New York Times article, "I'm convinced the Pine Tree flag is the oldest surviving Colonial Flag. I've seen the other four and Mr. Laube's is older. There are surviving flags in England that were used in the American colonies, but they are later." Ms. Goody was able to date the flag to the late 1600s because of the three ply woolen hand spun cotton used to make the flag. The Southold Flag pine tree is a simple triangle with a block beneath it for the stump. 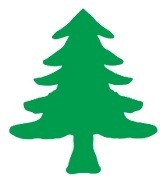 Since this is the only other surviving pine tree flag, some historians assume this was the common New England pine tree design. It cannot be said for sure that the Washington Cruisers Flag used this design, but it is the only possible design that can be based on real evidence. The "5 Regt." in the center of the Southold Flag also gives us an idea of what the font may have looked like on the Washington Cruisers Flag, again because it is the only surviving pine tree flag. So when we put all of the known facts together, we get a Washington Cruisers Flag that looks like the flag to the left. You could say this is a more authentic representation of the Washington Cruisers Flag than the ones typically sold today. The only part of this flag that is not certain is the location of the motto, "Appeal to Heaven." Washington Cruisers Flag - First Navy Flag? Many websites and books will call the First Navy Jack Flag the first flag of the United States Navy with its snake in the center over red and white stripes, along with the motto "Don't Tread On Me." But is this true? Historians for the most part have come to agree that the First Navy Jack Flag was probably never used during the Revolutionary War. Indeed, they believe it wasn't used by the United States Navy until... 1976! The First Navy Jack Flag probably comes from an engraving by British merchant Thomas Hart. Hart created an engraving of the first United States Navy Commodore, Esek Hopkins in which the First Navy Jack Flag appears. Hart had never seen Hopkins in person and the picture is inaccurate in many ways. Historians believe Hart's engraving was picked up by the publishers of books on flags over the next century. Eventually, during the United States bicentennial celebrations in 1976, navy staff found the First Navy Jack listed as the navy's first flag in history books and had them mass produced to be flown from US Navy ships, not knowing about the historical error. Learn more about the history of the First Navy Jack Flag here. In 2002, the US Navy announced the First Navy Jack Flag would be flown from all naval ships until the war on terrorism is over. Unfortunately, this is not the first naval flag of the United States. This honor goes to the Washington Cruisers Flag! Order your very own Washington Cruisers Flag here and support this website with your purchase.